Gear Up For The Greatest Spectacle on Earth! The moment that football (and soccer) fans from all over the globe have been waiting for will kick off on the 14th of June in the heart of Russian Federation. The FIFA World Cup is the world’s most-watched sporting event and has been capturing the imagination of billions since its inception in 1930. Russia will be hosting the world’s top 32 teams who will be giving it their all in a bid to get a glimpse of gold. Just like the Olympics, the world cup is organized every four years and is assigned its host by the autonomous body known as the FIFA Executive Committee. Russia came through as the most-deserving candidate to host the latest installment of this revered tournament, fending off stiff competition from its rivals in Portugal, Spain, Netherlands, and Belgium. The hosts are more than equipped to handle an event of this magnitude with an impressive line-up of world-class football facilities that consist of the Otkritie Arena, Krestovsky Stadium, Fisht Olympic Stadium, Kazan Arena, Rostov Arena, Volgograd Arena, Mordovia Arena, Ekaterinburg Arena, Nizhny Novgorod Stadium and the Kaliningrad Stadium. This year’s World Cup comes to our doorsteps without perennial favorites like Italy, along with reigning Copa America champions Chile, Cameroon, Holland and the United States, who spearhead the competition’s most notable absentee list. The official anthem by Nicki Jam featuring the inimitable Will Smith and Era Istrefi has added to the frenzy. Like every World Cup, there will be an opening ceremony to initiate proceedings, followed by the inaugural match between the hosts Russia and Saudi Arabia. The highly-anticipated opening ceremony will feature the likes of Robbie Williams, Anna Netrebko, Denis Matsuev, Albina Shagimuratova and Ildar Abdrazakovwho to name a few, who will be performing a sequence of hit numbers for the spectators in attendance at Moscow’s Luzhniki Stadium. Now, without further ado, let’s get to the crux of the matter at hand which is the teams in contention. The competition is divided into eight separate groups, namely A, B, C, D, E, F, G, H; each of which will be containing a total of four different squads. Unlike its predecessors, this year’s World Cup does not feature a definitive ‘Group of Death,’ which refers to a group that includes at least three powerful footballing nations, meaning that there will be one powerhouse who will be missing out on progressing to the knockout stages. While Brazil, Germany and Spain remain favorites to strike gold once again, teams like France, Argentina, Belgium and England can be counted as the dark horses of the tournament. The world cup has never been short of star power, so here’s a list of top players to watch out for this time around. Neymar: The swift-footed Brazilian talisman will be expected to provide assists and goals from his advanced wide left position. The mercurial forward’s temperament will be under close scrutiny from the media. Messi: Arguably the most gifted player to ever grace a football pitch, the Barcelona forward’s winning mentality, unmatched flair, and leadership skills serve Argentina in good stead. He will be under immense pressure to emulate the achievements of his childhood idol, the great Diego Maradona, who is still remembered to this day for his iconic ‘Hand of God’ moment. Ronaldo: Without a shadow of a doubt the world’s most prolific active goalscorer, Ronaldo’s well-rounded forward game will have to be at its absolute peak if the Euro Championship winners are to punch above their weight. This could possibly be his last world cup in the reds of Portugal, and he would ideally like to bow out of the international stage on a high. Mesut Ozil: Regarded as one of the game’s best playmakers, Germany’s hopes of retaining their title as ‘world champions’ firmly rests on Ozil’s shoulders to thread his trademark inch-perfect through balls and defense-splitting passes. Mohammed Salah: Salah is credited with single-handedly booking Egypt’s berth as a world cup qualifying nation this term. His searing pace, intelligent moves and clinical finishing will be dearly needed by his country if they have any chance to make it to the knockout stages. Harry Kane: An archetypal number nine, Harry Kane’s ability to hold up the ball is exemplary and complements his penchant for scoring scorching long-range goals to perfection. His form will be instrumental in defining England’s performance in this world cup. Eden Hazard: The diminutive winger’s dazzling runs have terrorized defenses for club and country for a better part of a decade. Belgium will be counting on his exceptional dribbling abilities to create space for his offensive-minded team-mates to exploit. Here’s the 2018 Group Stage schedule so that you don’t miss out on any of the action. For the Knockout Phase we recommend you check https://eventseeker.com/ for regular updates. We’ll be watching to see who lifts the golden cup. How about you? Do comment and let us know which colors you’ll be supporting this month. 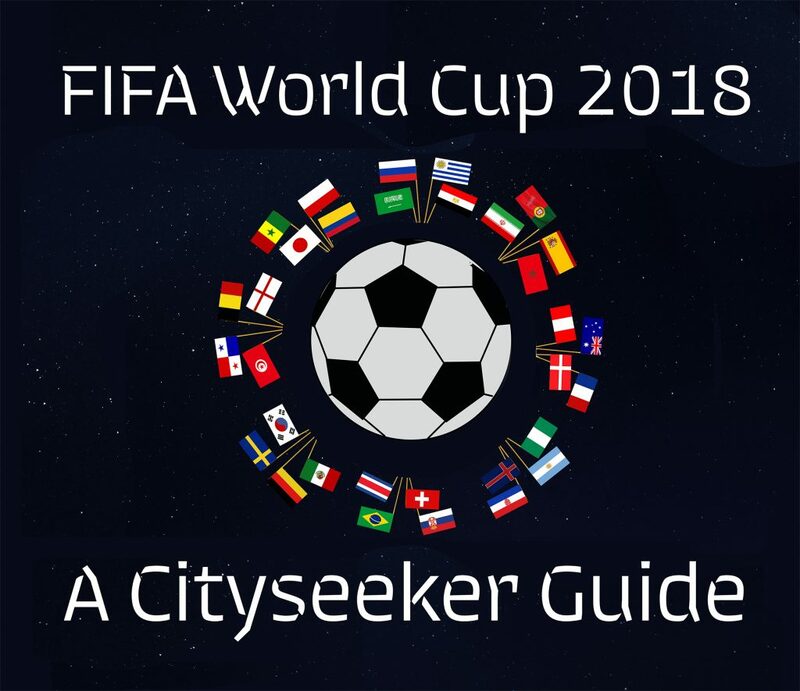 This entry was posted in Cityseeker Guides and tagged 2018, fifa, football, Russian Federation, soccer, world cup on June 14, 2018 by Nitin Chandran. Very well written. I hope Portugal lifts the cup this time. Go CR7.